Real Time Notification - Not working? Installed this tool on my PC. I set up my servers to monitor. I set up my mail settings. I tick the 'Send notification in realtime' option. I click on Verify and a successful email comes through. I click on Generate and a successful report gets downloaded. I clink on Apply, I type in credentials and an email comes through indicating success. Problem is that it doesn't notify me in real time when the free disk space falls below threshold. Apparently I should get reports every 3AM too, but those aren't coming through either. I noticed when I press Apply, the program closes. Is the program supposed to be open or closed in order for the automated reports to come through? Is there a service or application that is supposed to run in the background? It would be helpful to see what the tool's logs say. They are located in the installation folder (by default C:\Program Files (x86)\Netwrix\Disk Space Monitor\Tracing). Please post the logs and we'll see what's going on. Also, "notify in real time" is an option that schedules the disk space monitor task to run every 10 mins. You may want to take a look at the history of the task to see if it simply fails to start. Today, I turned on my PC and a notification came through. I would like to know more about the 'notify in real time' selection. Does it only notify me when the threshold is triggered between every 10 minute check? In case I failed at attaching a file, log file uploaded here. Yes, the tool is pretty simple and will notify you only when the threshold is triggered. It's not sending any scheduled status emails. By looking through the logs I did not see anything wrong with the tool. I agree that the tool is simple. I just didn't understand how the tool was supposed to operate. At 2018/07/11 11:05, I will add files in order to trigger the threshold. Copied multiple files to consume the free space and break the threshold. 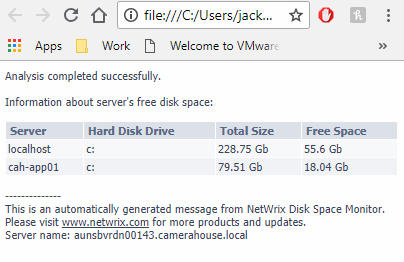 Current free space is 15.9GB. Am I supposed to have received a notification by now? Restarted PC. I'm not experiencing any that is telling me that the disk monitoring is working. I've checked the log and the last event was the one at 2018/07/11 10:52 where I applied the settings and generated the report. Started PC after 2 days powered off. I got 2 email notifications. 1 x Detailed Report, 1 x Notification Report. I don't understand the concept of Real Time Notifications? I only get notifications when my PC turns on after an extended period. EDIT: I'm going to switch to the Daily Notifications and see how that behaves. Started PC after shutdown previous night. Same as previous. 2 emails notifications. 1 x detailed report, 1 x notification report. It doesn't seem to be generating consistent reports throughout the day. Only has been producing reports when I first turn on the machine after a shut down the previous night.